Discussion in 'UFC Discussion' started by MF2x4, Jun 5, 2014. 1. Jones isn't falling for the surprise takedown element Gus used to win round 1. 2. Jones isn't going be surprised by the hand speed of Gus. I suspect Jones will be super aggressive and not let him fight from the outside. 3. Because of Jones being the aggressor and eager to shut fans, Gus, Dana and media up, I believe he'll score takedowns like we thought he would in the 1st fight with a more pressure/Judo-centric gameplan. 4. Jones will finish and worn out Gus by the 4th round. 5. Cormier will defeat Jones ala Cain/JDS 2 and defend against the winner of A. Johnson/Lil Nogs injury replacement in 2015. Also, for discussion purposes, what do people think Gus will do differently this time around? Send him to the morgue? Gus didn't commit to his punching combos due to fear of takedown. However as you saw, He stuffed Jones easily and even the 1 time he got taken down he dragged jones like he was little kid across the mat and got up. The only point that isn't completely stupid is 2. But TS let me ask you this, can't you say the same thing about Gustafsson? I guess I can see the general concept TS is floating. I can see Jones being much better in their next fight. It is harder for me to see Gus making the same type of leap. Which is just another way of me saying that I think Jones is the better fighter. So I would favor Jones in the rematch. But obviously Gus is "4 real"
Will Jones double up on the eye pokes this time? Thanks for a well thought out counter argument. I just feel like Jones is gonna be in Tasmanian devil mode with spinning sh*t, not allowing Gus to set his feet. Jones spent too much time on the outside and he knows it. Gus planting his feet and digging power shots in might lead to more takedown on opportunities, also. I think Gus won the first fight, but yes, it does feel like Jones has the higher ceiling for improvement. 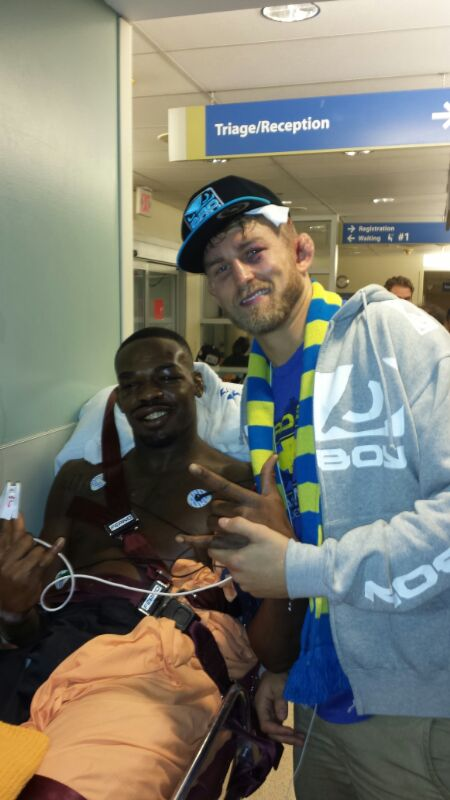 Hm how to put this... Gus game is more narrow than Jones', and imo he was overall better than Jones last fight. However Jones game is so diverse already and he seems to be able to improve for a long time yet. If DC was inbetween I'd be even more pessimistic. Well I'm asking, what are Gus's options for adjustments to Jones new (hypothetical) gameplan? This all seems pretty accurate actually. Thanks for the input. You're right, Jones has diversity in skillset, Gus is always gonna be Gus. He lost the surprise, but he also now knows he can beat Jones. Regardless I forsee Jones doing a Wall-n-Stall strategy. Jones seemed to get tagged a lot during the feeling out process in the first fight. He likes to teep the knee and use his length in the early going, and he was getting caught not moving his head. That set the tone for desperation fueled (failed) takedown attempts. This time his head will be moving and his elbows will play a bigger role. Thanks for the input. Very possible. How about Gustafsson won't be surprised by Jones' hand speed, he'll be more aggressive, blah blah blah... Everything you said about Jones but now switch the names, how does that sound?